There are certain activities that simply never get old. Even as the years go by and new advancements in technology change the way we live, these traditional pastimes stand the test of time and remain beloved from one generation to the next. Apple picking is a perfect example. Americans have been heading out with friends and families for many decades to do some apple picking at local farms and orchards, and this is still one of the very best activities to enjoy during the fall season each and every year, with dozens of super apple picking locations to be found in almost every state, especially in New England. Agriculture has always been a big part of New England life, with farms being set up by the first pilgrims to step foot on American soil and the climate in the region offering the perfect conditions for the growth of many different kinds of fruits and vegetables, including apples. This means that in states like New Hampshire, there are plenty of farms and orchards dating back over a century or more. Each fall, many of these locations open their doors to the public, welcoming guests of all ages for long, relaxing days of apple picking. Picking apples in NH is a great way to spend a day. Not only are apples a healthy snack to have around the home at all times, they’re also a highly versatile ingredient that can be used in a myriad of recipes, from pies and donuts to ciders and sauces. 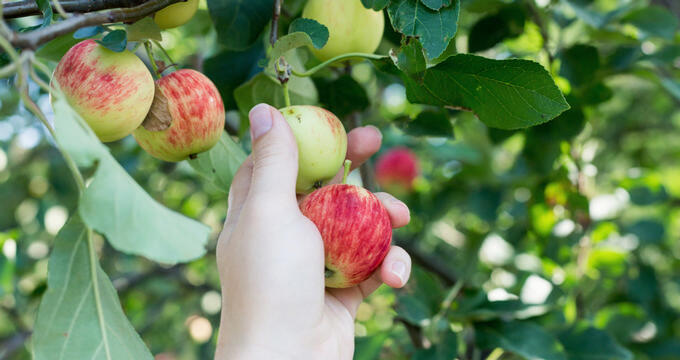 NH has a lot of excellent apple picking locations to choose from, so be sure to read on to learn all about the best rated apple orchards in the state. No list of apple picking locations in New Hampshire could be complete without a mention for Applecrest Farm Orchards. Why? Well, this is technically considered to be the oldest continuously operated apple orchard in the whole country. Applecrest Farm Orchards opened way back in 1913, meaning it has celebrated over a century of continuous use. More than 40 different kinds of apples are grown on this land including Red Delicious, Ida Red, Cortland, and McIntosh, as well as several other fruits and veggies. A farm market is located on site too, along with a farm-to-table farm bistro eatery. If you’re looking to do some NH apple picking, this has to be the number one spot on your location list. One of the best rated apple orchards in NH, Mack's Apples has been serving the state for many, many years. In fact, eight generations of the same family have been working on this land, making it one of the most historic apple orchards in New England. Mack's Apples covers 400 acres of land in total, with a quarter of that space being dedicated to apples. The pick-your-own experience at Mack's Apples has even won a couple of People's Choice awards in the past from New Hampshire Magazine, so you know you're in for an excellent time if you choose to visit this farm. Another highly rated NH apple picking location, Carter Hill Orchard offers a simple, family-friendly, authentic apple orchard experience that everyone can enjoy. Open each year from summer through to the end of fall, this location offers U-Pick on apples, blueberries, peaches, and raspberries. The apple varieties you can find at Carter Hill Orchard include Gala, Crispin, Granny Smith, Empire, Braeburn, Musu, Paula Red, Snow Sweet, Macoun, and many, many more. There's a lot of variety at this location, so if you want to take home many different kinds of apple, this might be the best place for you and your family to visit. Just a short drive north of Concord, Apple Hill Farm has been operating in New Hampshire for many years and is a wonderful spot for friends and families to come together and get back in touch with nature. There's always a friendly, family-style welcome waiting for you at Apple Hill Farm, with some fun special events held here each year like Halloween events and a farm stand selling fresh baked products and other tasty treats. As for the apples, Apple Hill Farm grows a lot of different varieties including Honeycrisp, Paula Red, Ginger Gold, Hampshire, Northern Spy, Fuji, Crispin, Baldwin, Gala, Red Delicious, and others, with different varieties being offered for U-Pick as the season progresses.